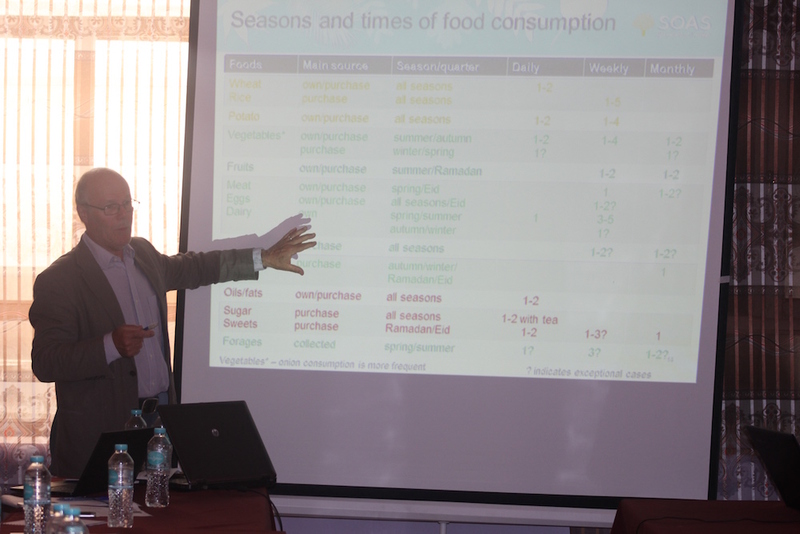 In conclusion of the DFID-funded LANSA (Leveraging Agriculture for Nutrition in South Asia) project, conducted jointly by ECOA and SOAS University of London, two workshops were held in Bamyan on 8-9 July 2018, hosted and catered by Noorband Qala Hotel. The workshops concluded ECOA’s part of the LANSA project, carried out jointly with SOAS University of London in 2016-2017. 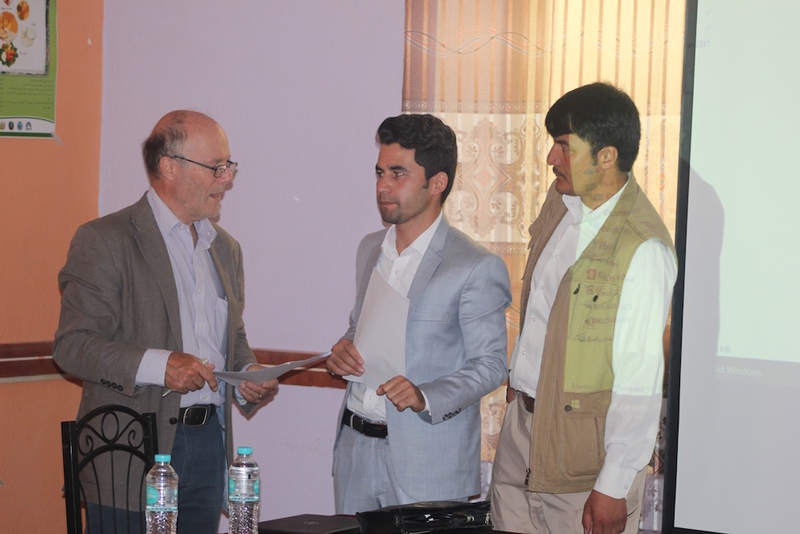 Dr. Nigel Poole, the project lead, delivered keynote presentations on both days, followed by NEPA and MAIL, Medair, CRS and WCS who talked about related activities they conduct across Bamyan province. Presentations and discussions were held both in English and Dari, with the help of bilingual speakers and some interpreting by our own project officer Islamudin Farhank. The first day of presentations was dedicated to community consultations, whereby 35 beneficiaries (both men and women) attended the event, participated in the discussion, asked questions and voiced their concerns. 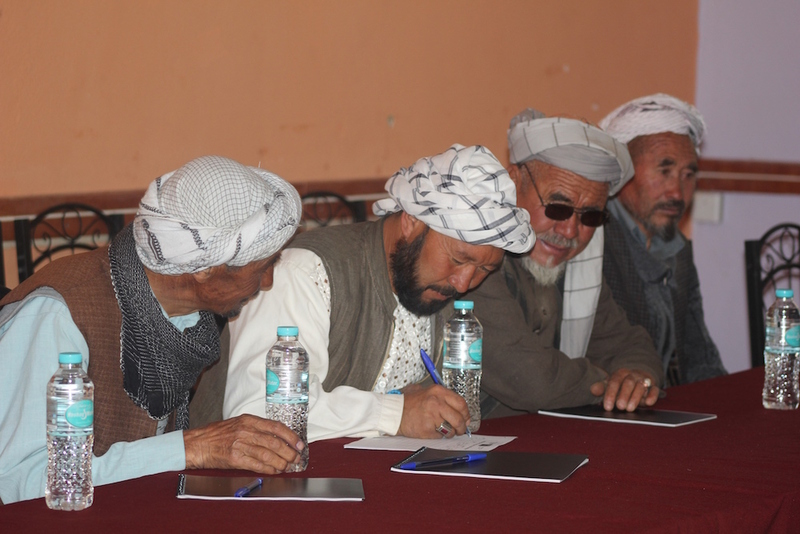 Development and humanitarian NGOs across Bamyan are actively tackling the issue of micronutrient deficiency and related agricultural needs. A presentation from Medair Bamyan focused on the project that implements kitchen gardens alongside compost and WASH trainings in the Central Highlands, in order to develop capacities for sustainable households and empower women. With consultations provided by experienced Medair agri-nutrition specialists, kitchen gardens are envisioned as durable and sustainable solutions for improved household economy. On the other hand, many families from Shah Foladi communities noted that they do not consider stocking up on summer produce for the winter simply because of insufficient outputs. Most dairy products, essential for nutrition (especially for young mothers, pregnant women and children), are consumed and sold as they are produced, throughout the summer and early autumn. While yoghurt, qurut, milk are still available in Bamyan bazaar during the winter, most Shah Foladi villages do not have access to dairy in winter and spring due to poor household economy and road infrastructure. Asked about the possibility to increase dairy outputs throughout the summer, all women from Shah Foladi communities agreed that they have both time and capacity to do so, given sufficient equipment and livestock. While one of the suggested initiatives to boost dairy outputs would be to increase livestock numbers and improve its maintenance (which CRS Bamyan discussed in their project presentation), this would produce an obvious impact on biodiversity in Shah Foladi, an area already faced with threats of overgrazing, unsustainable fuel and fodder collection, and soil erosion. Same concerns would apply to the proposed expansion of farmland, which was taken by the community representatives with a grain of doubt: many villagers said they did not have sufficient access to land or irrigation to maintain more agricultural farmland than they currently do. For a few of them, cultivation of rain fed wheat is a complementary way of securing their livelihoods alongside irrigated farming. Research data presented by WCS Bamyan showed evidence of how unsustainable grazing and widespread cultivation of lalmi (rain fed wheat) is affecting the ecosystem health in Band-e Amir National Park, despite the positive effect of tourism on local economy. If we were to look into the future of Shah Foladi as a protected area, and the development of ecotourism with reliance on local communities, we must plan ahead to ensure that agriculture and livestock maintenance are developed with a knowledge-based approach, by studying inputs from qualified agriculture professionals and practitioners as well as environmental experts, and careful assessment of previous experiences of integrated approach to ecosystem conservation and livelihoods improvement. During the community-focused workshop on Day 1, a representative from Jawzary valley (one of the target communities in our research) noted that their village would benefit from professional consultants who could advise on agricultural cycles, nutritional value of different types of produce, and types of crops that could be cultivated throughout the summer to produce sufficient yields and enrich the soil for the following year. On a policy side, discussed in detail during Day 2, Dr. Poole placed emphasis on the great potential of Citizen’s Charter for decentralized development of agriculture in Afghanistan. To ensure that policies really benefit local communities, they need to be based on local knowledge and experience rather than on top-down approach from Kabul. To ensure that government agencies like MAIL, NEPA, MoPH, MoE are empowered to draft local policies that really benefit community stakeholders, it is vital to gather up-to-date inter-cluster data from local and international stakeholders, academia, and CDCs. 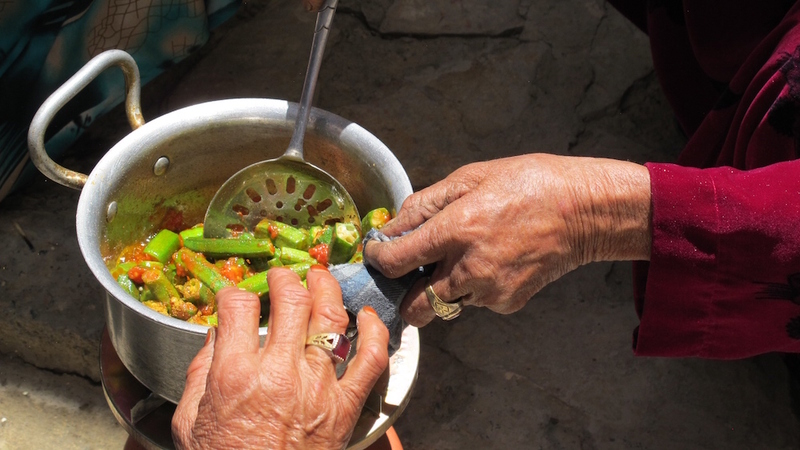 The issue of agri-nutrition is relevant not just for the development sector and its long-term projects to enhance agricultural potential of Afghanistan, benefit smallholder farmers and contribute to economic prosperity. Leveraging agriculture for nutrition in Afghanistan could also help government agencies to face humanitarian challenges across the country (related to migration or natural disasters), and tap into some problems within school education (such as irregular attendance due to lack of school meals, and parents pulling children out of school to work on family farms). More importantly, it is only on local basis that we can develop relevant environmental policies to ensure that the enhancement of agriculture does not impact fragile mountain ecosystems in Bamyan province and is ready to correct its course according to environmental assessments and concerns. As an interactive bonus of the workshop, just before lunch, both men and women were invited to take part in a cooking challenge under instructions of Zainab, a talented chef from Noorband Qala hotel. In order to underline the importance of dietary diversity, the cooking challenge included ingredients of balanced nutritional value, trying to minimize the use of oil and sugar that are extremely popular in local cuisine. Fry the onions in the oil and add chopped tomatoes with a little salt. Throw the chopped okra pods in and add a little water if you fear it might burn. Cook on slow fire until the pods are soft and brownish in colour, adding spices according to your taste. Serve with fried rice or shir berenj (sticky salty milk rice). You may access the presentations from the workshop here. Should you have any questions or proposals, do get in touch with us through the Contact Form on the website.